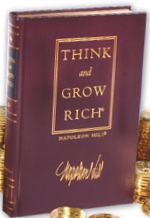 April Book Club Selection Napoleon Hill Think and Grow Rich | WHAT’S UP WITH THAT GREAT BOOK YOU NEVER FINISH READING? Napoleon Hill’s Think and Grow Rich is a standard of social research. Prompted by Andrew Carnegie, a young investigative reporter spent the rest of his life asking “What are the habits that successful people exhibit?” and distilling information so that ordinary individuals could take small steps in a successful way and achieve exceptional results. This is a great book with which to kick off a book club since Mr. Hill is a faithful believer in the power of synergistic master mind group discussion. Here are five starter questions that will stimulate conversation, action and excitement. What does it take for an individual to start believing in the power of Mr. Hill’s concepts? What does desire mean and how do you recognize the power it holds in your life? Why do some people ignore obstacles while others become fearful? How does one develop persistence? What is possible with a master mind group? 1) Download the pdf of the book: MTThinkandgrowrichGoldBar Go to page 20. Read from: “The method by which DESIRE for riches can be transmuted ….” to the end of the page. 2) Do just the first three of the six steps. 3) Spend 10 minutes a day daydreaming about how you will feel when you are able to trade that amount for whatever it is that you REALLY want! If you do this for 30 days, you will grow your desire and strengthen your imagination. Home made whipped cream! Excellent piece, continue to keep in place the awesome job. This is the type of information that should obtain acknowledgement pertaining to it’s craft. Far more writers should learn from you. This is actually right on the money. Erzähl doch bitte nochmal ein bisschen ausführlicher. Ich würde gerne mehr darüber hören. It is refreshing site I would say the facts I uncovered useful. I’ve saved it and can come by for a second time afterwards. Many thanks. Hi there, just recently discovered your site through MSN, and been coming back regularly. You have a great site! Do you mind if I link to it from my Website at this page? I am grateful for your fine blog post; this is the variety of thing that sustains me though out the day.I have forever already been hunting close to to your website just after I learned about them from a good friend and was thrilled when I was able to locate it after researching for some time. Becoming a avid blogger, I’m thrilled to find out other folks taking motivation and adding for the community. I just desired to opinion to display my thankfulness for your submit as it is really stimulating, and lots of freelancers usually do not get the credit they ought to have. I am confident I’ll be back again and will send a few of my acquaintances. Thanks for all of your hard work. I really enjoy reading your blog daily. I like this info and it has presented me some sort of inspiration to have success for some reason, so thank you. Furthermore I′m definitely considering writing these figures in my own blog! TY, wonderful job! Exactly the information I needed to get. Useful tips discussed I’m really pleased to go through this article..thanks with regard to presenting us nice info.Great walk-through. I appreciate this kind of post. I see quite a number of blogs which appear intriguing and worth a read. There probably is absolutely nothing worse than searching through limitless blah blah blogs just to locate a couple which hold your interest. Many thanks. Great work!